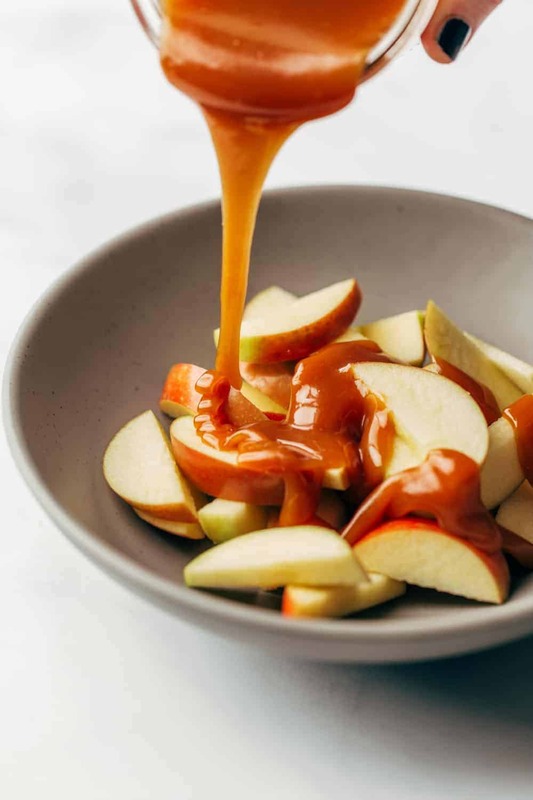 A simple recipe for homemade salted caramel sauce that is the perfect topping for just about anything, from apples and ice cream to brownies and cheesecake. Yesterday I was watching The Biggest Loser on the DVR while making mini cheesecakes – the irony, right? Come on, they were mini! When I was ready to top them, I realized that I was out of salted caramel sauce. I made a batch about 2 weeks ago, but had forgotten that we had used it up last week. I was feeling a tad bit lazy and totally engrossed in watching the last chance workout – again with the irony. Needless to say, I wasn’t quite up to the task of making a new batch of salted caramel sauce. However, changing out of my yoga pants and slippers and heading to the market seemed like so much more of a hassle considering it was 10pm. I can’t be the only one. I ended up pausing the DVR and heading into the kitchen to whip up a fresh batch of salted caramel sauce. It’s definitely more delicious than the store bought version, and who wants to shell out $7 for a small jar at the market? Not this girl, especially when I can make salted caramel sauce at home with ingredients that I always have on hand. And customize it to make it just right for us. 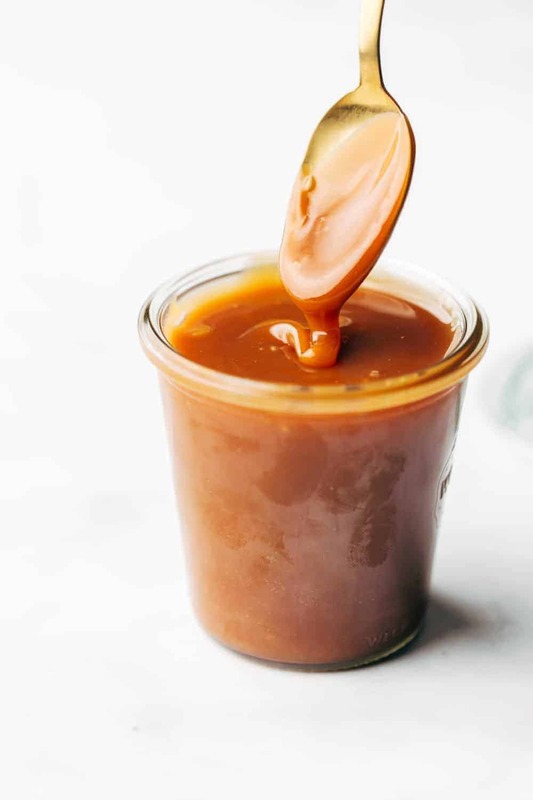 If you’ve never made homemade salted caramel sauce, it can definitely seem a bit overwhelming, but it’s honestly not too hard – I promise. One key tip is to rely on the color of the sugar before adding in the cream. You can definitely use a candy thermometer if you have a reliable one. I have 3 and each of them varies by 3-5 degrees, which can be quite a difference when you’re making homemade caramel sauce or candy. In my opinion, it’s best to look for that deep amber color. But be forewarned – that gorgeous deep amber color can transition to a burnt mess in a matter of seconds. Just be sure to be free from distractions and keep your eye on the pan and you’ll be good to go! I’m pretty confident that if you follow the directions below, you’ll be a salted caramel sauce-making pro in no time! Besides, knowing how to make caramel sauce is a pretty useful trick. 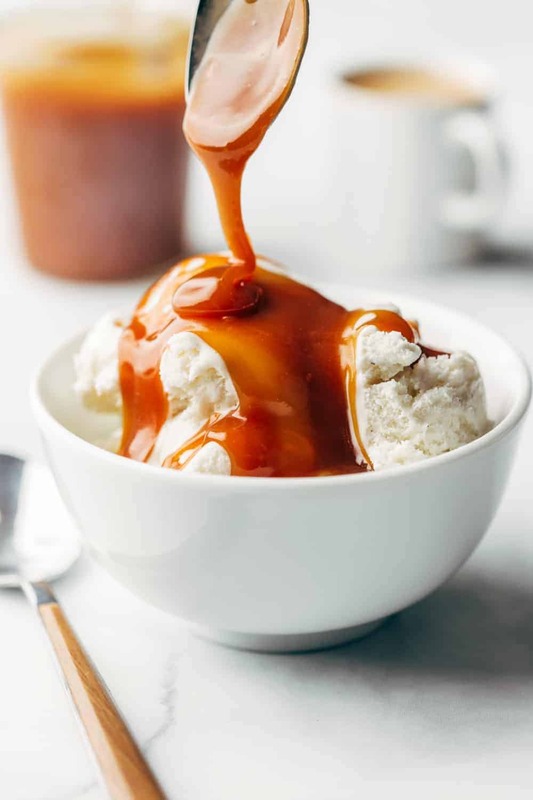 Salted caramel sauce is pretty darn delicious drizzled over just about any dessert. From ice cream and cakes to a dipping sauce for apples, pretzels and brownie bites – it’s addictive! I like to drizzle it over Mini Apple Pies, use it for topping Mini Pumpkin Cheesecakes, or blend it into Salted Caramel Pretzel Milkshakes. If you like fun drinks, you could even mix it into a Salted Caramel Apple Cocktail. 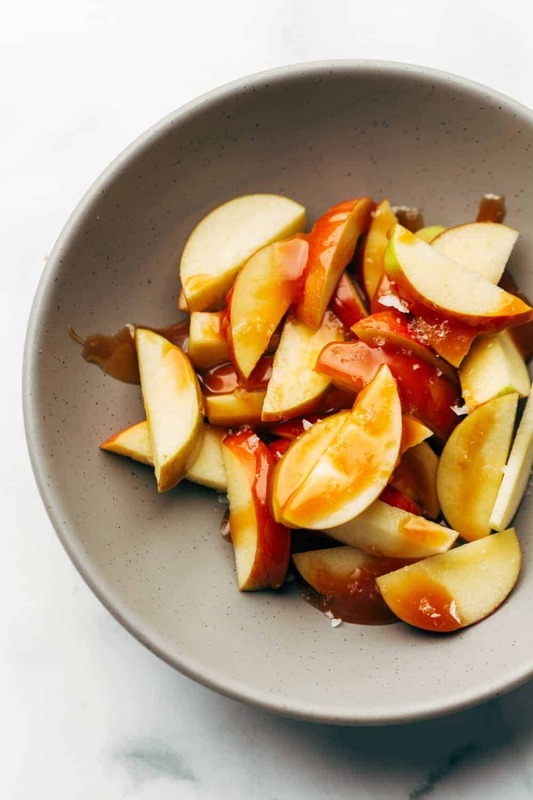 You can keep salted caramel sauce in the fridge for a week or so, if it lasts that long! Once I made it, we were dipping apples and pretzel sticks every chance we got. Dangerous situation, let me tell you. If you’re feeling fancy, you can also add a few spices – cinnamon or apple pie spice would be awesome, or even pumpkin pie spice if you’re making it in fall. Do a trio of customized sauces and gift them to your favorite hostess! Salted caramel sauce is just so easy to make, I bet you’ll find yourself in the kitchen at 10pm whipping it up. Biggest Loser or not! 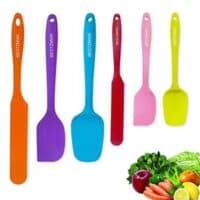 In a heavy saucepan (at least 5 cup capacity), stir together the sugar, corn syrup, and water until the sugar is completely moistened. If you are using a candy thermometer, place it into the pot taking care that it is tip in immersed into the sugar mixture. Heat, stirring constantly, until the sugar dissolves and the sugar syrup is bubbling. Stop stirring completely and allow it to boil undisturbed until it turns a deep amber (like the color of Bass Ale) (see notes below). This will occur right around 350 degrees. 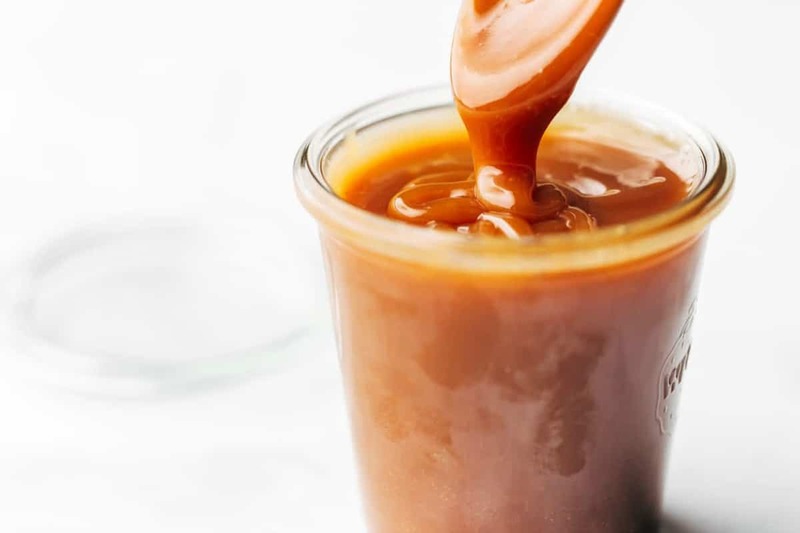 Immediately remove it from the heat and slowly and carefully pour the hot cream into the caramel. It will bubble up furiously. I have 3 thermometers and they all register different temperatures. In my opinion, it's best to rely on the color of the caramel as opposed to the temperature. You want to look for a dark dark amber color. However, dark amber goes to burnt in a matter of seconds. If using a thermometer, start paying close attention at about 340 degrees. Once the color deepens, pull the mixture from the heat. I love caramel but not salted caramel. can I make this without the salt? thanks. Hi, Caroline! You can absolutely leave out the salt. I hope you enjoy it! Could you give me an estimated approximate time it takes to reach the recommended amber color? Thank you. Hi, Cindy! 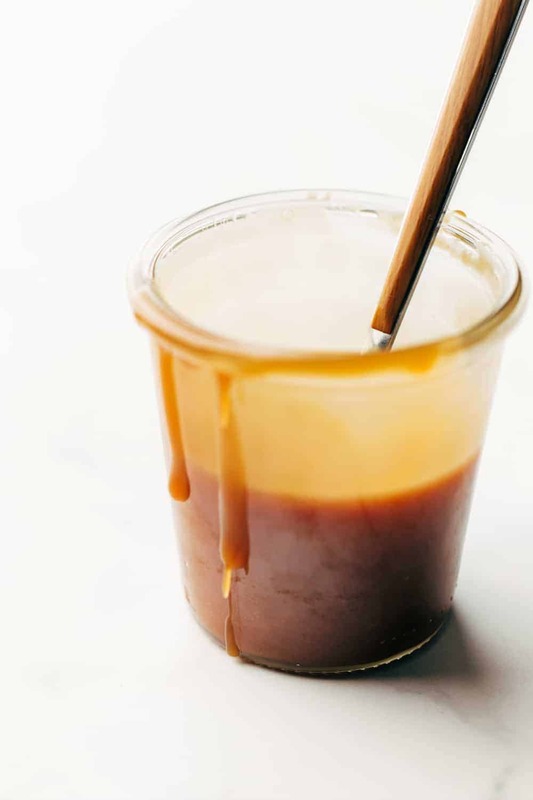 It probably won’t take very long for the caramel sauce to darken…probably just a few minutes. I hope this helps! I just made a batch…it took abt a minute an a half to become the amber i wanted. Hi, Jodie! I think it will only last for a few days. I hope everyone enjoys it! I tried this delicious sauce but it set hard in the jar and I couldn’t get any of it out !!!! I tried to warm it up to no avail . Can you help me as to why it happened? Did I over heat it ? I’m usually a good cook and can manage most things in the kitchen,I will try again .Love you blog. Hi, Linda! I’m sorry your caramel sauce hardened up. I think maybe it was overheated. Caramel hardening is a common problem and has no reflection on you as a cook! Maybe stop before the caramel reaches 350 degrees…around 330 or 340 maybe? Let me know if this helps. I appreciate your kind words! Is this something that can be canned and saved along with jams and jellies? I don’t think so, Keri. I think the heavy cream and butter in the recipe would be a problem. I hope this helps! This is awesome!!!! First time I ever made caramel sauce and I’m in heaven!!! Thank you. I made this yesterday and I absolutely loved it! The caramel sauce is truly divine and the cheesecake itself is scrumptious! I did not use carmel pretzels–I used crushed pretzels and graham crackers for the crust, and put whole salted pretzels on the top with lots of drizzled caramel on top. 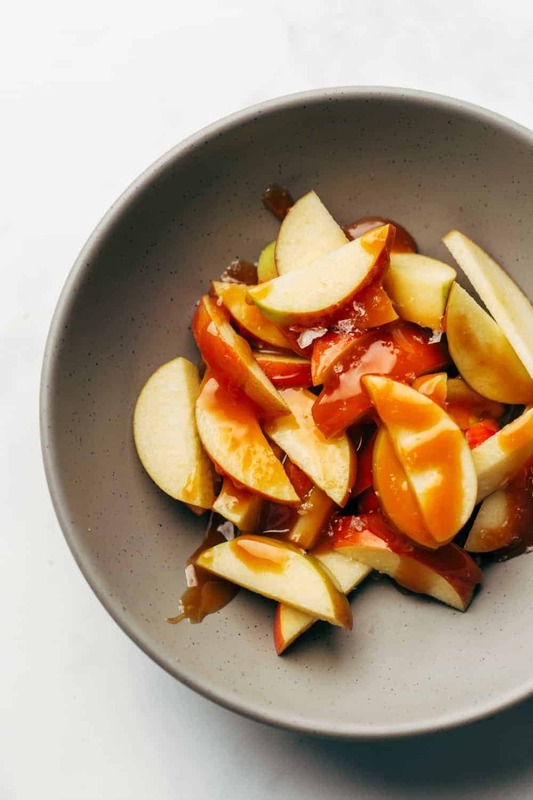 I am positively obsessed with this caramel sauce, as it is simply perfection! I’m so glad to hear that, Jennifer! So glad to hear that, Sandra! “Immediately remove it from the heat and slowly and carefully pour the hot cream into the caramel”. What do you mean “Pour over caramel? Are you talking about caramel candies? (Caramel is not included on your ingredient listing?? What did I miss? Hi, Katherine! The sugar syrup in the pan that’s bubbling is the caramel. Let me know if I can help with anything else. I hope you enjoy it! Hi, Steve! I think maybe the sugar syrup should have cooked longer. Let me know if you give it another try! This is where I have always been confused. When it calls for heavy cream, is it heavy whipping cream or half and half? Hi, Kelly! It’s heavy whipping cream. I hope you enjoy it! Hi wondering if this will go well over an unbaked cheesecake? Does it get very stiff/hard once cooked ? Hi, Ayesha! I think the salted caramel sauce would be wonderful over cheesecake. If you find the sauce is getting a little stiff, just rewarm in the microwave for about a minute. Let me know how you like it! Hi, Bushra! I’ve always used corn syrup in caramel, so I honestly don’t know. Maybe brown sugar and brown rice syrup? I hope this helps a little bit! Hi you recipe looks great! Im making mini Hesse cakes for this Saturday and I was wondering how much I need for 24mini cheese cakes? I was thinking of simply drizzling it on top of each mini cheese cake. I should divide the recipe in how many? Thank you so much! Hi, Giulia! I think one recipe should probably give you enough for 24 mini cheesecakes. Let me know how it goes! *mini cheese cakes. Darn autocorrect haha! I cannot find corn syrup here in Australia, can I use maple syrup as a substitute? Hi, Dawn! I’ve never used maple syrup in this recipe, but I suppose you could give it a try. Maybe try brown sugar and brown rice syrup? I hope this helps a little bit! I have used maple syrup (as I couldn’t find any corn syrup here) and it works just fine! oh wow, look at the sauce and I fall in love with it. I will make it and upload the photo for sure. Let me know how you like it, Ly! What do you mean heavy cream? Is that like half an half.or what if you dont have any heavy cream is thete anything you can substitute instead? Hi, Gloria! Heavy cream is the same as double cream. I’ve never substituted anything for the heavy cream in this recipe, but I suppose you could try full fat milk. I hope you enjoy it! OMG, I just made this, it turned out great and the best part is I dont have to pay 6 bucks for jarred sauce from the grocery store again!!! Wonderful, Dawn! I’m so glad you liked it! Can this be canned via water bath method? I am not much of a canner, Joyce, but hopefully someone will chime in with some input. Thanks for stopping by! Thanks for the tip, Sherri! Hi Joyce, No a hot water bath will not do it for the salted caramel sauce. The butter and cream would have to be done in a pressure canner; and I’m not real sure even that would work; I don’t know about the caramel either. How about freezing it? But then it wouldn’t make for an attractive gift I don’t suppose. Well, that’s about all I know for sure. Hope that helps. Good luck. And, I love this recipe also. It’s delicious Jamie, YUMMERS!!!! and thank you so much. May I ask if I can store it in freezer for later use? Many thanks! 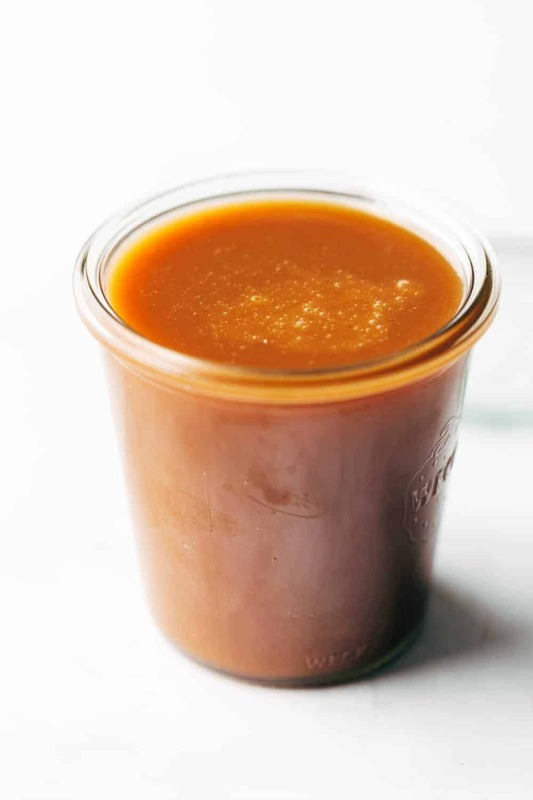 Hello, I have never tried freezing this caramel sauce, so I am not really sure how it would do. Sorry I am not of more help! Made this today to drizzle on my cheesecake. It turned out great! Thank you for this recipe and the great instructions! Yay! So happy to hear you enjoyed the caramel sauce, Melissa! Thanks so much for stopping by and leaving your feedback. Happy Baking! This sauce is AMAZING! I have made it twice now, once for your salted caramel cheesecake (ALSO AMAZING) and for some brownies. This caramel has the perfect balance of salty and sweets, and keeps beautifully! Great job! Yay! So happy to hear you enjoyed the caramel sauce! Thanks so much for stopping by and leaving your feedback. Happy Baking! hi, can i exclude the corn syrup? will it make the taste so much different? Hello! I haven’t attempted this recipe without the corny syrup, so I am not sure of the result. Corn syrup doesn’t affect the flavor as much as it stabilizes the mixture as the sugars cook. If you happen to give it a try, I’d love to know how it turns out. Thanks so much for stopping by. 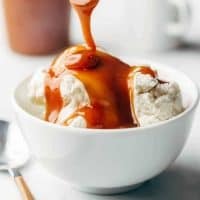 Best Salted Caramel recipe I’ve used, highly recommended!! So happy to hear you enjoyed the caramel sauce, Nicole! Thanks so much for stopping by and leaving your feedback! So happy to hear you enjoyed the caramel sauce, Hope! Thanks so much for stopping by and leaving your feedback! Hello I made a batch but it split into 2 after cooled off.. darker at the bottom..can it be saved? Hello – I’ve never had this issue and without having been there to watch you make it, I am not sure what might have gone wrong or if it is salvageable. Sorry I can’t be of more help.